In light of recent high-profile cases of scientific misconduct, the General Assembly of the International Council for Science (ICSU) reaffirmed the universal values that should guide the conduct of science. The assembly also explicitly recognized the key social responsibilities of the scientific community as laid out in a new booklet, Freedom, Responsibility, and the Universality of Science, which will be made widely available to scientists across the world. Ultimately the integrity of science depends on scientists themselves and all scientists have a duty to expose fraudulent information and/or misconduct. Given the unique position of scientists as the gate-keepers of new knowledge in today’s knowledge societies, respect for these values is critically important if confidence in science is to be maintained. The booklet asserts that “all scientists have a responsibility to ensure that they conduct their work with honesty and integrity; to ensure that methods and results are reported in an accurate, orderly, timely, and open fashion.” The booklet goes on to say that scientists are expected to be impartial, fair, respectful and considerate in relation to fellow human-beings, animals and the environment, and to acknowledge risk and uncertainty. 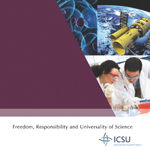 By extending its consideration of the long-established Principle of the Universality of Science to explicitly include responsibilities as well as freedoms, ICSU emphasizes that this balance is critical both for science and society. The booklet and more on the ICSU General Assembly are available at <www.icsu.org/3_mediacentre/GA_29.html>. Founded in 1931, ICSU is a nongovernmental organization with a global membership of national scientific bodies (114 members, representing 134 countries) and International Scientific Unions (29 members). The council is frequently called upon to speak on behalf of the global scientific community and to act as an advisor in matters ranging from the environment to conduct in science. ICSU’s activities focus on three areas: planning and coordinating research; science for policy; and strengthening the Universality of Science.